On Sunday, June 24, 2018 the United States Agency for International Development’s (USAID) Ujjiban Social and Behavior Change Communication Project signed an Memorandum of Understanding (MoU) with Radio Sagar Giri to air a radio program on different health issues. The radio program is expected to raise awareness of critical health issues and to create a conducive environment for sustainable health behavior change. The program will go on air from early July. 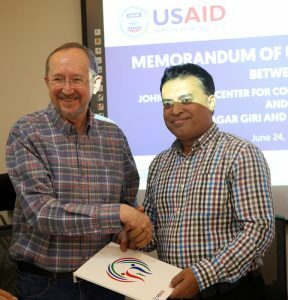 The program will be funded by the United States Agency for International Development’s (USAID), and co-produced by Johns Hopkins Center for Communication Programs and Radio Sagar Giri. 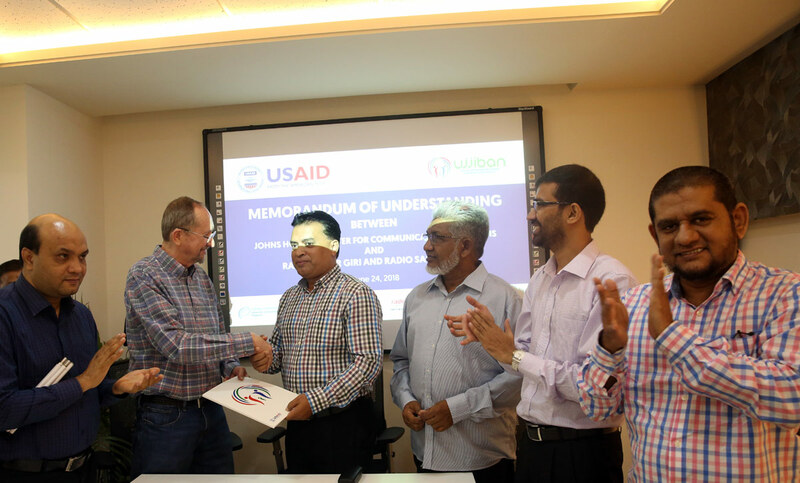 Ujjiban is a five-year project, funded by USAID and implemented by Johns Hopkins Center for Communication Programs in partnership with Bangladesh Center for Communication Programs and Save the Children. The project focuses on improving individual and family health status in terms of maternal, neonatal, child and adolescent health, nutrition, family planning and tuberculosis. Ujjiban works with the Ministry of Health and Family Welfare at national, divisional and district levels to strengthen their capacity to design and implement effective social and behavior change communication interventions. It also works with community based organizations to engage its various target audiences. Ujjiban promotes health-related messages on radio programs, drama series, a travel show, and TV advertisements. The transmedia approach focuses on engaging the audience through an entertainment education approach. Moreover, Ujjiban’s approach to disseminate health information is through triggering social and behavioral change including influencing gender norms at the community and family levels. In addition to broadcast media, Ujjiban uses digital tools such as social media and online games, and mobile apps and interactive voice responses to create engaging platforms for families, youth and health professionals.